Musicians create tracks-dedications, rethink the writer’s works, translate text to the language of sounds and vibrations. Sound Interpretations are opened with compilation dedicated to Julio Cortazar. 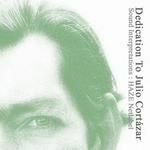 18 sound artists from all over the world translate images, mood, tempo and rhythm of Julio Cortazar into the language of music. You look at me, from close up you look at me, closer and closer and then we play cyclops, we look closer and closer at one another and our eyes get larger, they come closer, they merge into one and the two cyplopses look at each other, blending as they breathe, our mouths touch and struggle in gentle warmth, biting each other with their lips, barely holding their tongues on their teeth, playing in corners where a heavy air comes and goes with an old perfume and a silence. Then my hands go to sink into your hair, to cherish slowly the depth of your hair while we kiss as if our mouths were filled with flowers or with fish, with lively movements and dark fragrance. And if we bite each other the pain is sweet, and if we smother each other in a brief and terrible sucking in together of our breaths, that momentary death is beautiful. And there is but one saliva and one flavor of ripe fruit, and I feel you tremble against me like a moon on the water.